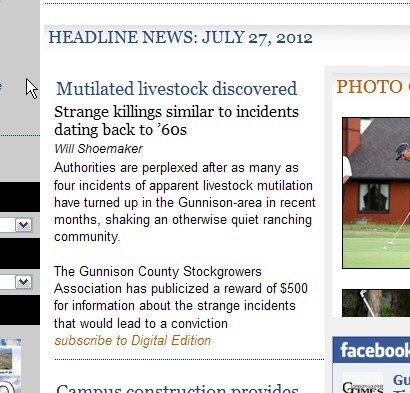 This is a screen shot of the Gunnison Country Magazine with the reference to the recent rise in cattle mutilations in the area. I am looking for more info on this. There was a movie with George C. Scott concerning strange deaths of herds of sheep during the 50's/60's. The movie pointed at the U.S. Army Bio/Chem weapon research. The USA is the most likely suspect as usual.